King 5 news picked up the story and did a great job with it - see it here. Samoa Victim Support Group is Shrinking Heads! Yes we do mean that literally, but don’t worry, they are only Styrofoam heads. Children of SVSG were onboard the U.S. research vessel Thomas G. Thompson this week participating in a science experiment with oceanographers from the University of Washington in Seattle. You may recall UW’s first mission here last year where they laid the groundwork for research on the strong ocean currents 4-5 kilometers below the surface that run through the Samoan Passage---largest and deepest slot in a series of ridges separating the deep basins of the North and South Pacific that is roughly 400 km north of Upolu. The team is back this year to collect data from their instruments that they set in the Samoa Passage last year. While they are at it, they will take the Styrofoam heads decorated by SVSG and send them 5 kilometers below the ocean surface where the water pressure will shrink the heads to a fraction of their original size, with the decorations/drawings become very detailed. This change in size of the heads gives a very real sense of the immense pressures that both deep-sea life and the scientific instruments have to deal with. 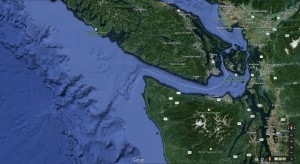 According to the ship’s scientists the Samoan Passage acts as a nozzle that funnels deep ocean currents in the Pacific. About six million tons of water flow through the passage every second, or 30 times the average flow of the Amazon. Over the coming months, a team led by Mathew Alford, a Principal Oceanographer and Associate Professor at the School of Oceanography at the University of Washington, will study and measure the water flows, analyze tidal changes, and assess ocean turbulence. According to Alford, the more turbulent the flow the more it exchanges heat with the warmer water above. “This is important because the deep circulation of the Pacific is the key to understanding sea level rise and the way the planet will respond to climate change.” This includes measuring underwater waves that can reach over 1000 feet. One Samoan scientist from the Ministry of Natural Resources and Environment is scheduled to join the ship and participate in the research over the coming months. The ship, along with the shrunken heads will return in mid-February. 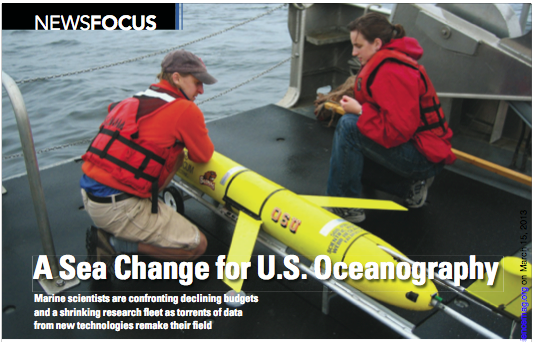 Alford was quoted in a recent article by Eli Kintisch, "A Sea Change for U.S. Oceanography," on the current status and future of oceanography. Kim Martini, the first PhD student from the Wavechasers group, has moved on to a postdoc with Harper Simmons at University of Alaska Fairbanks, but is still finding time to blog and tweet about internal waves. Way to go Kim! 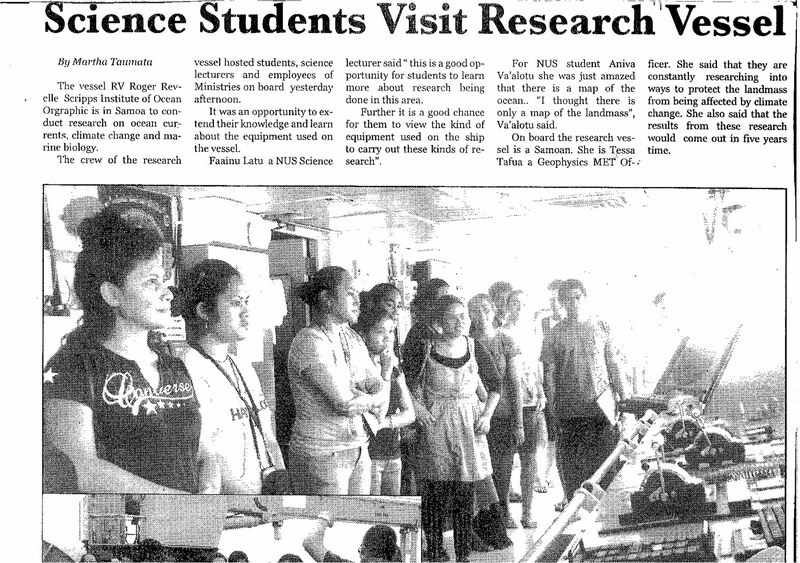 The Revelle hosted visits from two groups of Samoan scientists and students as well as two news teams while were loading the ship (photos here at the US embassy site). We made "top story" on the TV channel, and were written up in two of the local newspapers. This was the top story at Honolulu's KHON. Check out the original story at KHON, CNN and ABC. 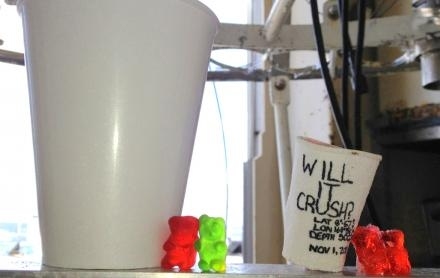 We had hoped that developing a "crush cam" would provide a point of interest for sharing our research with non-scientists----but we were still stunned by the interest.